Intel (s INTC) is shuttering its Digital Home Group, which means the next generation of Google (s GOOG) TV and Boxee devices will be powered by ARM-based chip sets. The folks who have been working on Intel’s CE products are absorbed by the company’s tablet group, AnandTech reported Monday night. Intel has since confirmed the move. “This was a tough decision; Intel led the creation and launch of the smart TV category and its first products,” I was told by a spokesperson. 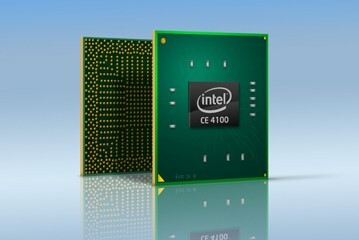 Intel’s Digital Home Group was behind the CE4100 Atom processor, which powers D-Link’s Boxee Box, Logitech’s (s LOGI) Revue and Sony’s (s sne) Google TV products. The company will now exit the connected device space and instead concentrate its TV efforts on chips for the next generation of pay TV set-top boxes and residential gateways, which is industry-speak for cable modems. I asked Google and Boxee how they felt about the move, but both companies shrugged it off as a minor hiccup. “Boxee’s always been hardware agnostic. We built Boxee to run on multiple chipsets,” Boxee VP of Marketing Andrew Kippen said via email, adding: “Our first Alpha was actually built on an ARM based chipset.” He also pointed out that Intel will continue to sell and support the CE4100, which means that the current-generation Boxee Box won’t be disappearing any time soon. Google didn’t seem too worried either. “Intel has been a great partner for us throughout the launch of Google TV. We continue to work with many chipset partners, including Intel, to bring new Smart TV products to the market,” a spokesperson told me via email . If I had to guess, I’d say those future products are more about the intersection of TVs and tablets than traditional Google TV boxes. It’s been clear for a while that the next generation of Google TV devices will be powered by ARM-based chipsets, which should also bring the price of these devices down significantly. Sources familiar with the matter told me today that Google has in fact multiple deals for these kinds of devices sealed. All of this makes me wonder whether Intel’s decision to pull out of this market may actually have been a reaction to a move away from it’s platform, or whether it was based on the sales numbers of current-generation smart TV devices – which haven’t been great, to put it kindly. Either way, the big winner at the end of the day seems to be ARM. This is not as big a win for ARM as people think since the two customers Intel loses are small fry (Google TV, Boxee) if famous, and the wholesale cable Set Top Box market is much, much bigger as I learned when I went to IPTV World Forum in London last May. Boxee is a great product but I’d estimate sales sub 200,000 units. Companies like Sagem that do STBs for cable providers in Europe ship millions and millions and it’s all SoC/ARM. Idea with something like Intel CE4200 is you save man years on software development and it costs about $35 – not a bad sales pitch. So Digital Home Group “closing” just means Intel is going for where the money is and that’s STBs. 2. Full profile video decode support. My experience so far is that only Intel delivered both of these. Of course over time, these issues (Flash in particular) will get solved on ARM and MIPS architectures. Flash is still required to get full open web – HTML5 hasn’t anywhere near replaced it yet. Even though the gap is closing, there were some shocking attempts at Android on ARM as STBs at the IBC show. Getting all those drivers optimised for different implementations of ARM is not easy – hence the relative delay in good Android based tablets hitting the market. Not sure why hardware accelerated Flash 10.x is a (major) requirement for TV. Netflix, Vudu, Hulu and every other streaming service out there can live (and live well) without Flash 10. Obstinate as it might be, Apple has proven that you don’t need *any* Flash at all, and can still sell millions of devices. And get the Netflixes of the world to comply. Intel of course has proven ability to run Flash, but what does Intel know about TV? Note that a real TV SoC (unlike the Intel toys) has several other stuff built-in… Intel seems to have (finally!) realized that an instruction set alone will not win the TV market for them. If Android is not taking off in TV/STB, it is largely because Google has done nearly nothing to evangelize Android in this space. And TV/STB players have meanwhile created their own proprietary babel tower of smart TV frameworks. That’s the reason why, in my previous post, I referred to the need for an external jolt to bring in some rationality here. a) 99% of the Smart TVs out there today don’t use Intel CPUs. Intel has had a TV (actually CE) division for a long time now but failed miserably to get designed-in by any major TV maker, in any significant way. The Sony-Google TV is considered an aberration by both the parents. Ditto for the Logitech box. b) There are many ARM based Smart TVs, but not all Smart TVs use ARM. There are many TVs out there that are powered by MIPS. I don’t have exact figures, but I’d estimate that this number is easily over 40%. Of course ARM could still be the leader, but TV, unlike mobile, is not a ARM monopoly. Not by far. c) There is no single/few established SmartTV concept (unlike with smart phone). You can find tonnes of TVs doing Netflix, FB, Twitter, widgets, browsers etc.. and each of them does it differently. The Armdroid propaganda machine has failed to entice the TV industry. The proprietary Smart TV frameworks can survive and do well for some time. Perhaps an external jolt (such as real TV from Apple) will bring in some rationality for a common framework. Until then, ARM and MIPS will continue to rub shoulders in the Frys, Costcos, Best Buys etc. Intel never was here and never had a real chance. Finally RISC is killing off the ridiculous CISC architecture. This hardware agnosticism is mostly made possible by the GNU cross-compilers. It’s ironic that this post exists right above the post about Roku, which is using a Broadcom SOC. Does the BRCM SoC use ARM ? Partnering with Intel to make the first Google TV set top box that ended up costing $300 was Google’s biggest mistake by far. This is why I still don’t understand why they want to optimize Android for Atom. ARM is simply better at anything Atom can do. It’s already starting to surpass it in performance, while keeping an order of magnitude less power consumption. Intel will eventually announce that they’ve ceded the “car market” to ARM, too, because again, there’s no reason why you wouldn’t want an ARM chip rather than Intel’s Atom inside cars for the same or better performance, smaller price, and much smaller power consumption. And Boxee would’ve used Tegra 2 if it wasn’t so bad at high profile HD video. So this probably means that the upcoming Boxee is running on an ARM chip, probably Nvidia’s Kal-el. Google should really take advantage of this, and get a lot of developers to optimize their Android games for Kal-el powered $100-$150 set top boxes, and turn Google TV into a console platform as well. If they don’t do it, Apple might do it first with the upcoming A5-powered Apple TV. does broadcom have anything competitive in this area ? Broadcom recently shuttered their DTV/Blu-ray group too. Blah blah blah….Intel can not compete with ARM in terms of power vs efficiency. Until Intel actually releases a product, anything they say is just vaporware. Come on, Adam, Intel is going to sell Atoms for mobile phones running Android. They said so themselves, so it must be right. Intel is a great example of the hammer seeing everything as a nail. Intel keeps trying to convince people to buy what they sell, instead of building things that people want to buy. People don’t want phones or tablets with an Atom, because the battery life won’t compete with ARM. And yet, that (and endless marketing failures) hasn’t stopped them. They haven’t yet realized that people buy x86 systems only because of the Windows compatibility, which is non-existent outside of the desktop. And they should be worried about windows 8, which will run on ARM. Intel used to have an ARM group, but they sold it, probably because they weren’t able to sell ARM chips for $100 or more. They are probably wishing they still had that division. If they don’t make changes soon, they will be the next decade’s Kodak. Even if Intel’s architecture went away completely, they still have one of the best fab lines available. They’ll be fine. @anonymous, their fab lines are only economical when building parts that cost from $40-$500. If they could build $10 SoCs and make 60% gross margins, I’m guessing they would already be doing that.